As a teenager, it was never my choice to go to Saint Barnabas High School. My cousin Aileen, a year ahead of me, went there and didn’t have a good word to say about it. In fact, she would have transferred to Cathedral High had her parents let her, but the tuition at Cathedral was $5 more per month. More importantly, all of my classmates graduating PS #14 in Yonkers were heading to Roosevelt High, a co-ed school. Naturally, I wanted to do the same. My father had other ideas. I went to St Barnabas, an all-girl Catholic high school in the Woodlawn section of the north Bronx. I don’t remember how I got to school the first day, don’t remember a single worrisome detail. All I recall is that knot in my stomach, my qualms about going from a public to a parochial school. But in short order, I made the necessary adjustments and found classmates with whom to walk the two miles from home to school each day. This we did for all four years, years that zipped by. And to this day, I look back fondly on those times and treasure the friends I made at Saint Barnabas, many of whom remain friends to this day. So, when invited to visit and speak to the graduating seniors, I readily accepted. Thomas Wolfe’s, You Can’t Go Home Again gave pause, but only for a second. 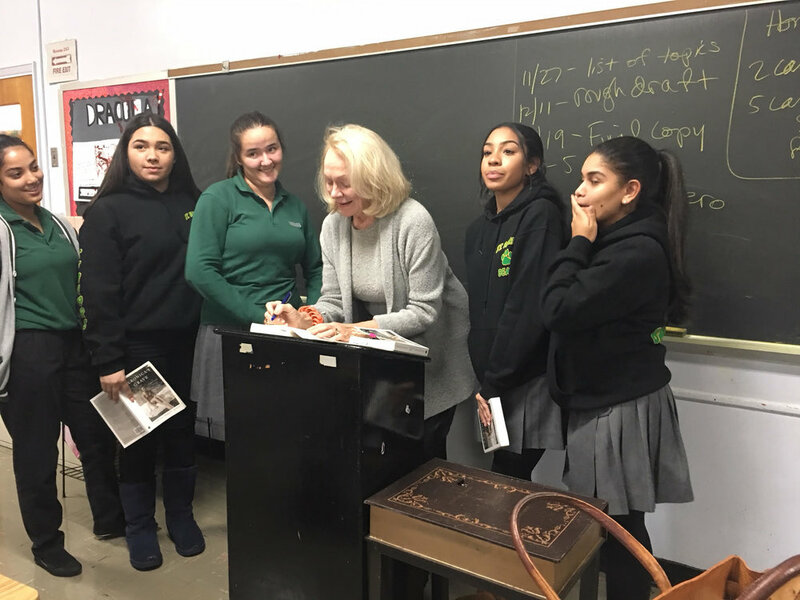 As a precautionary measure, I asked that the students read Veronica’s Grave, my memoir, before I arrived, all the better to discuss it. Done! It was a joy to go 'home' again, to see what the years had fashioned. For starters, the former high school, which had been housed on the third floor of the parish elementary school, had been replaced years ago with a handsome facility directly across the street. The classrooms and corridors felt bright and airy, particularly compared to the dimly lit central corridor in the old building. Then, too, the uniforms were greatly improved. Gone were the widely unpopular laced-up brown oxfords of yore. 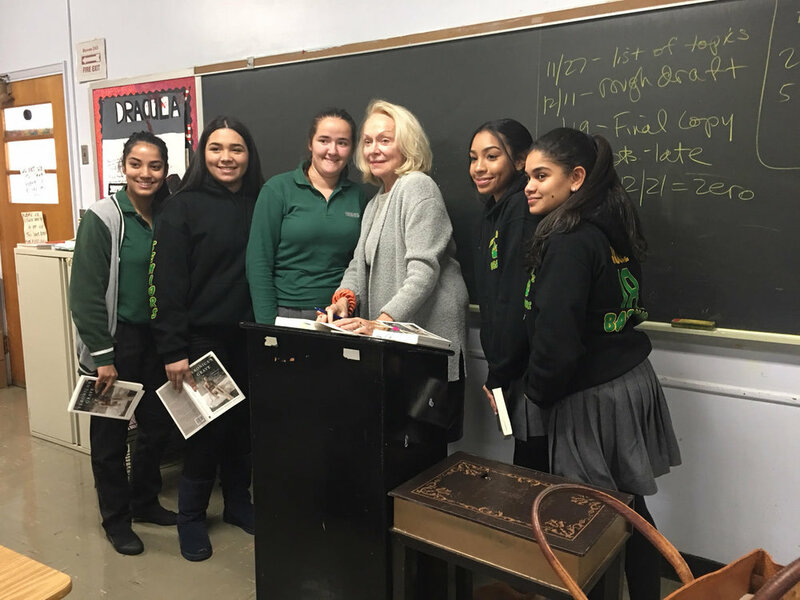 After an introduction by Mr. Donald Boyce, the English teacher, a lively discussion ensued with students questioning the loss of my mother and how I coped. The most poignant moment came as I leaned over to sign a copy of Veronica's Grave: A Daughter's Memoir for a young woman who confided that her mother had died recently. Of course, I was happy that she felt free to share her sorrow with me, and I hoped that in some small measure the memoir might be a consolation as she grieves her life-changing loss. It's for her, a recently bereaved young woman, and for millions like her who have suffered a primal loss that I wrote the memoir. It was a wonderful day, a chance to meet some of the students and to look at their faces and see how young I was when I attended St Barnabas High School. For all that, and for so many other blessings, I remain grateful. And now, with November drawing to a close, I wish you and yours a heartwarming Thanksgiving Day—without any politics. Je vous souhaite un bon Thanksgiving!